Biotech's legal victory over larger drugmaker could be fleeting, experts say. NEW YORK (CNNMoney.com) -- The bell's about to sound for the next round in a patent fight that the entire pharmaceutical industry is watching. Ariad, based near Boston, sued Indianapolis-based Lilly, accusing the larger company's drugs Evista and Xigris of infringing the patent on its experimental drug pathway, NFkB. Jurors in U.S. District Court in Boston agreed with Ariad, slapping Lilly with $65 million in damages in May. But critics of Ariad's patent - which covers a method of treating disease by regulating a certain type of cell activity -say it's too broad. On Monday, the two companies face off in a bench trial, where the judge will review the jury's finding, and Lilly says it's going to try and convince the judge to reverse the award. If that doesn't work, Lilly says it will appeal. "The jury's decision is flawed," said Lilly spokesman Phil Belt. "We disagree with it. We certainly feel strongly that the patent is too broad." The outcome of the trial could have huge implications for the drug industry, whose sales totaled $266 billion in North American last year, according to IMS Health, a drug industry research firm. That's because the patent revolves around the way a drug works in the body, not the drug itself. If Ariad's patent is upheld, that could affect not just new drugs but a host of drugs already on the market. 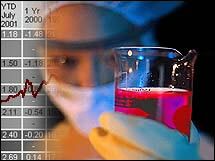 To be on the safe side, the world's biggest biotechnology company, Amgen (down $2.13 to $68.79, Charts), took action after the jury award in the Ariad-Lilly case to protect patents on two of its drugs, Enbrel and Kineret, both treatments for rheumatoid arthritis, by moving to define the drugs' legal status. Ariad chief executive Harvey Berger was not available for comment on Friday. But he said in an interview after the ruling in the Lilly case that he was "delighted at the outcome" of the lawsuit, and vowed to "prevail at the bench trial." In addition to the $65 million in damages for prior sales, the jurors said Lilly had to pay Ariad a royalty of 2.3 percent on future sales of Evista and Xigris until Ariad's patent expired in 2019. Evista, a treatment for osteoporosis in post-menopausal women, totaled $1 billion in 2005 sales, and Xigris, for the reduction of death in patients with severe infection, totaled $214 million in 2005 sales. While this won't have a major impact to Lilly, which totaled $14.6 billion in sales last year, it would be a windfall for Ariad, with a net loss of $55 million last year. But will Ariad ever see that $65 million and royalties? Patent lawyer Michael Shuster, co-chair of Fenwick & West Life Sciences Practices with a PhD in biophysics, believes that Ariad's patent is vulnerable, as courts are starting to crack down on patents they see as too broad. "There's a general notion that patents are becoming anti-competitive; they are throwing up so many roadblocks that it's becoming difficult to bring new products to market," said Shuster, who is not involved in the Lilly vs. Ariad case. "The courts are trying to decide where to draw the line. How broad is too broad?" "Too many patents are creating a thicket of claims that have to be navigated in order to bring (patented drugs) to market," he said. Philip Nadeau, analyst for Cowen and Co., said investors aren't banking on Ariad's ability to get royalties from drugs that existed before its patent was even created. "My personal bias is that I don't believe Lilly infringed the patent and it is unsatisfying to me that inventions made back in the 1980s could infringe a patent that didn't exist until a decade later," said Nadeau, who rates Ariad a "buy." "This seems counter-productive if you can get a patent after the invention and sue the investors who infringed the patent," said Nadeau. Aside from the patent battle, analysts are focused on the experimental drug, AP23573. The drug has earned praise from analysts, who expect it to be approved as a treatment to increase survival time in patients with soft tissue and bone sarcoma. The drug works by starving the cancer cells of mTOR, the protein that causes them to multiply. "That drug is why we recommend Ariad stock," said Nadeau, who believes that AP23573 will be launched, presumably under a new name, in 2008, reaching $125 million in annual sales by 2010. Since the drug is in early-stage studies to treat other forms of cancer, it could eventually bring in additional sales, said Nadeau. Joseph Pantginis, analyst for Canaccord Adams, projects that the sarcoma drug could get approved late in 2007, totaling $700 million in annual sales within five years. Pantginis, who rates Ariad a "buy" with a price target of $7 a share, up from about its current price of about $4, said investors are focusing on the experimental drug, without placing any bets on the patent suit because of its riskiness. "They're focusing exclusively at this point on the company's lead drug candidate," said Pantginis, referring to AP23573. "People are keeping an eye on the litigation, but it's a wait-and-see as to whether they'll get any cash" from the royalties and damages. Correction: An earlier version of the story misidentified the legal battle as a drug patent dispute instead of as a drug pathway patent dispute. CNNMoney.com regrets the error.